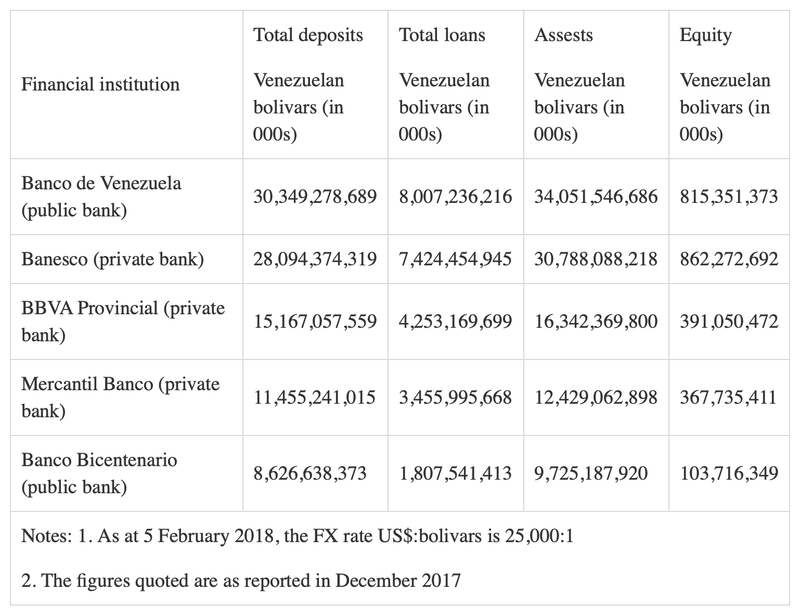 Back in 2012, Rachael Boothroyd wrote an interesting article entitled “Venezuela Increases Banks’ Obligatory Social Contributions, U.S. and Europe Does Not” which appeared on Venezuelanalysis. This missive which was written three short years after Wall Street banks caused the near collapse of the global economy gives us a sense of yet another one of the reasons why Washington is moving against the democratically Maduro government, trying to replace it with one that is more palatable to their narrative. As background, during the 2008 – 2009 crisis, paralleling the situation in the world’s advanced economies, it became apparent that Venezuela’s private banking sector was rife with “administration and managerial problems that left them in a situation of illiquidity that did not allow them to cover their obligations” and that some banks were guilty of fraudulent behaviour. 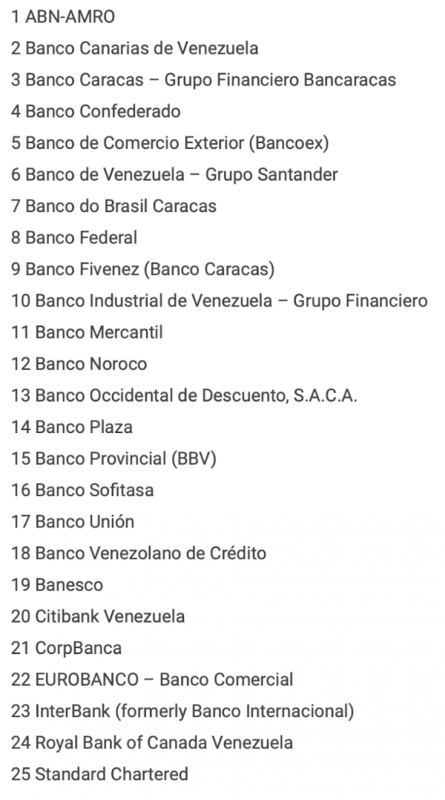 In November and December 2009, Venezuela’s Superintendency of Banks and Other Financial Institutions (SUDEBAN) took over eight small private banks after a fraud scandal in the nation’s banking sector with some of the banks being nationalized. 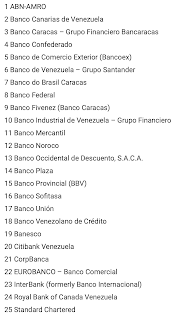 In addition, ten bankers and public functionaries were arrested as a result of the scandal and judicial orders were issued to prevent 28 banking executives from leaving Venezuela (although it was believed that 23 of the bankers had fled to the United States, Spain and Curacao. In January 2009, SUDEBAN took over an additional three small banks in January 2009 and sanctioned ten other banks with fines for failing to comply with financing regulations in the agricultural sector. 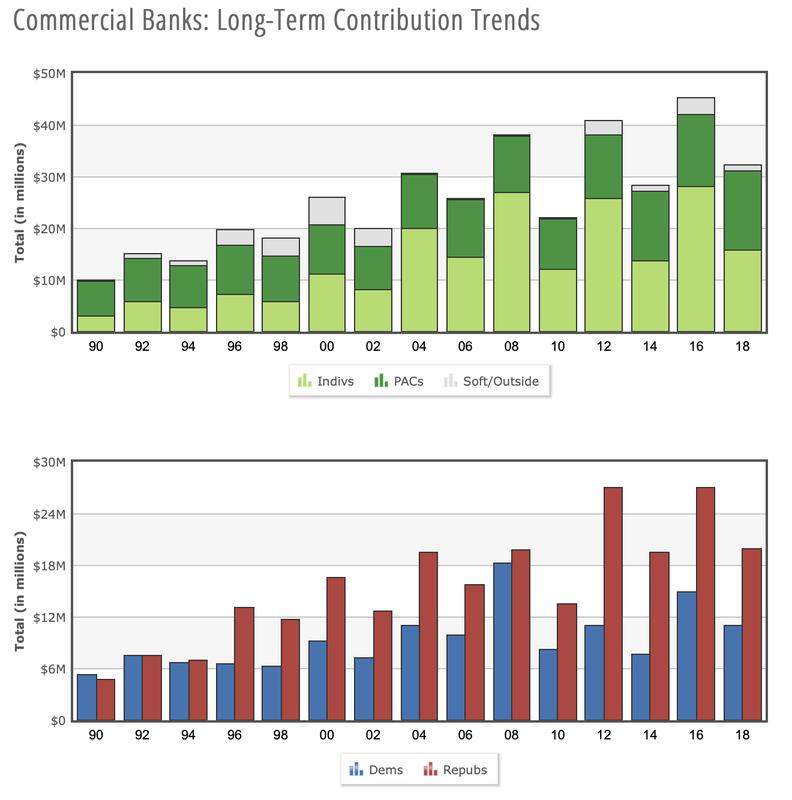 Unlike the United States where the federal government (aka American taxpayers) bailed out the banking sector culprits, in Venezuela, to clean up the banking sector, the government continued to take over banks in 2010 and by the end of March 2011, Venezuela had only 37 private banks, down from 59 in November 2009. By 2011, state-owned institutions held 35 percent of the banking sector’s assets and foreign institutions held only 13.2 percent of assets. As of early February 2019, GMVV claims to have completed 2,554,254 housing units. 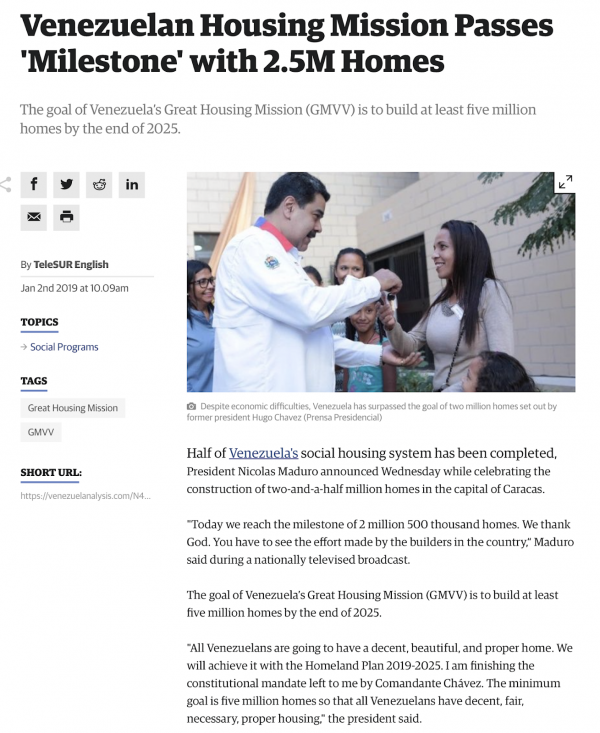 According to Ms. Boothroyd, the 15 percent levy on Venezuelan bank earnings was divided as follows; 66 percent towards granting credits for house building projects, 26 percent towards credit for house buyers and 8 percent towards credit for carrying out improvements and self construction projects on Venezuelans’ first homes. Of the 60 percent dedicated to house building projects, 55 percent went directly to the government’s Housing and Environment Ministry for the Great Housing Mission and 40 percent went to the construction of houses for families with incomes no higher than 6 times the national minimum wage. Venezuela’s government also took other steps that impacted the nation’s banking sector; banks are not allowed to participate in brokerage firms and insurance companies, they cannot form financial enterprises with other sectors of the economy, they must minimize financial risk-taking and speculation and they must also put 10 percent of their capital into a fund for wages and pensions that can be used in the event of a bankruptcy. 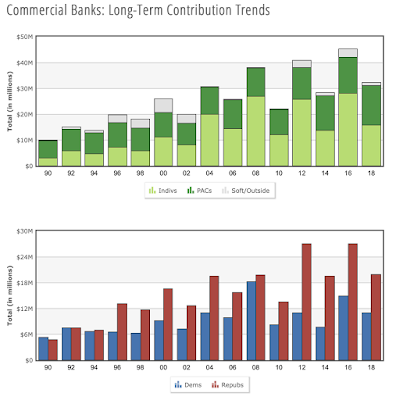 Banks are also obligated to grant loans to five industries on more beneficial terms than for any other sectors or industries; agriculture (up to 25 percent of the credit portfolio), mortgages (up to 20 percent), tourism (up to 4.24 percent), manufacturing (up to 10 percent), microloans (up to 3 percent) with the bank’s total loan portfolio to account for no more than 62.24 percent of its entire portfolio. Through the 2010 Law of the National Financial System and its banking sector restructuring and regulating, the Venezuela government is attempting to force the nation’s banking sector towards the “public interest” to create a “social state of law and justice“. Can you imagine that happening in the West? “Right now in the U.S. and Europe, it is painfully clear that the banks are firmly back in control, with no concrete measures having been adopted to curb their autonomy. In financial hotspots such as New York and London, banks are what continue to make the world go round for the movers and shakers of the city, who continue to perpetuate the myth that banking institutions are great wealth creators and are as such untouchable. In the midst of the human fallout from the banking crisis, it is hard to maintain this mantra. 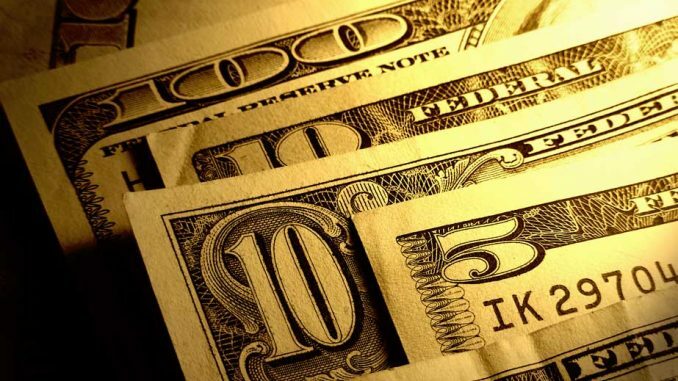 The movement of banks into speculation and stock broking has turned the international banking system into a global casino which has everything to do with the uninhibited flow of great sums of capital but nothing to do with the creation of wealth; much less to do with human development. In Venezuela, this vision is being reconceptualised so that banks have a socially productive role, as opposed to a parasitic one. Evidently, it is the lack of initiative on the part of governments in the U.S. and Europe to bring banks back under the control of the state through regulation and legislation, and not the lack of an alternative, which has meant that the autonomy of the banks has gone virtually unchallenged in wake of the financial crisis. Because Venezuela has proved that, despite the globalised nature of the banking system, these changes can be implemented when the government is on the side of the people and not the financial institutions. 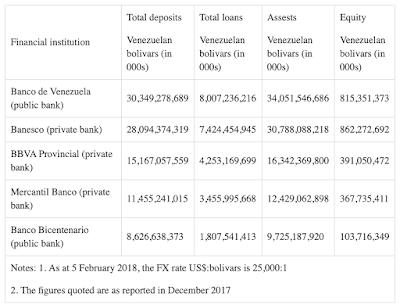 Nonetheless, the implementation of socially responsible banking by Venezuela is something that is viewed by Washington as yet another particularly unpalatable aspect of doing business in a nation that would surely welcome several of America’s commercial banks should its current banking regulations be rolled back. Given the nation’s massive economic potential, America’s bankers must be excited about the prospect of even higher profitability based on business opportunities in Venezuela.